It’s LGBT History Month! 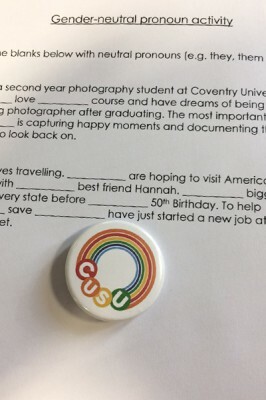 And if you’ve read our blog, you’ll know that Coventry’s Students’ Union have been putting on brilliant events to celebrate and educate our Coventry community. This month, there will be LGBTQIA+ Awareness Training available for all Coventry University staff, delivered by 2nd and 3rd year students Matt (Media and Communications) and Cameron (Management and Leadership). So I went along to learn as much as I could. Let me start by saying not everyone in the room knew what all the letters in LGBTQIA+ stand for and Matt and Cameron were brilliant at making sure everyone knew they were there to learn and that not knowing something is OK. The training then moves on to a quick online quiz and a gender-neutral pronouns exercise. 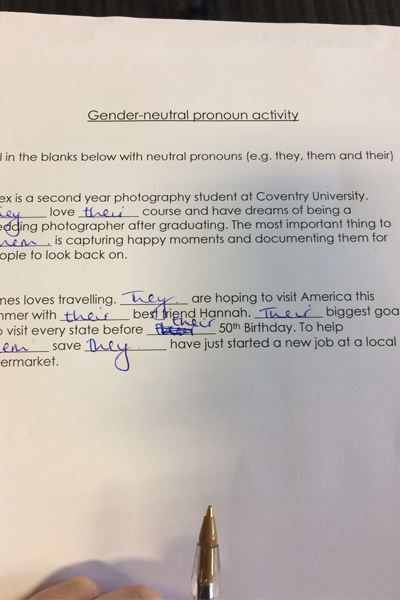 This aims to demonstrate how we can use words like ‘they’, ‘them’ and ‘their’ as easily as binary pronouns like ‘she’ and ‘he’. Even though this feels a little strange at first for most people who try it, it’s really easy. Most importantly, thinking about these issues when writing or delivering lectures can help to make non-binary trans people feel more comfortable and included in the university experience. This training highlights many really important facts for universities to consider. Did you know? 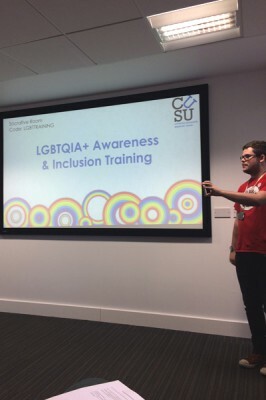 Recent NUS research into the LGBT+ experience has shown 51% of trans respondents have seriously considered dropping out of their course. 56% of LGBT respondents said not fitting in was the main reason they considered dropping out. Research has suggested LGBT students are twice as likely to experience mental health problems. 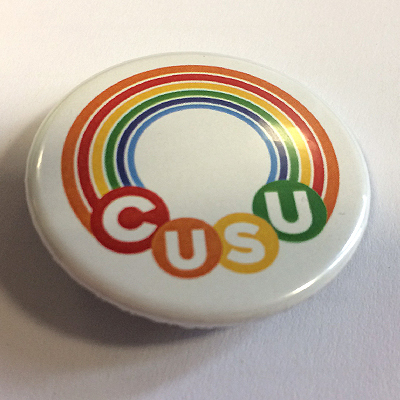 Cameron and Matt showed some really interesting research done by CUSU concerning Coventry’s students. Importantly, they provided the staff in attendance with advice on how to combat some of the problems indicated in the survey. 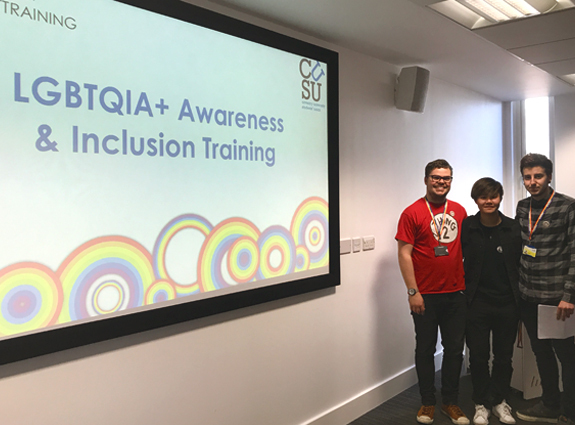 They talked about ways to help people feel less isolated and provided reading materials on how to make course content more inclusive and reflective of the LGBTQIA+ experience. I think what Matt and Cameron demonstrated really clearly is that there’s a need in education (and the wider world) to think more and harder about inclusion. There are a lot of outdated ways of thinking that we could all benefit from undoing and reworking. 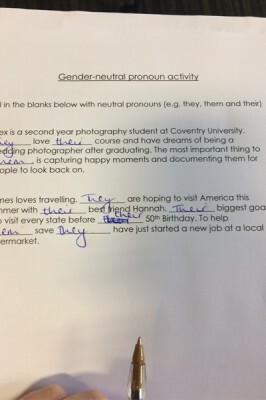 Whether it’s pronouns, offensive terminology, or assuming heteronormative language; this kind of awareness training is a fantastic first step in combatting behaviours which could make others feel isolated or uncomfortable. If these issues are important to you, get in touch via our social media channels, or in the comments below. Cov Uni would love to hear your views! If you’d like to read more blog content around this topic, click here.